Some cool images courtesy of SpaceX. Above, technicians prepare the Dragon spacecraft for thermal vacuum chamber testing in a SpaceX clean room shown above in Hawthorne (Los Angeles) California. The open bays will hold the parachutes. 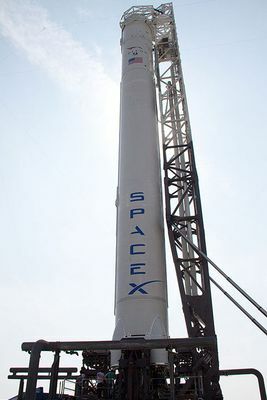 NASA has given SpaceX a launch date of Nov 30, 2011 for Falcon 9 Flight 3, which will send a Dragon spacecraft to the International Space Station (ISS) as part of NASA’s Commercial Orbital Transportation Services program. 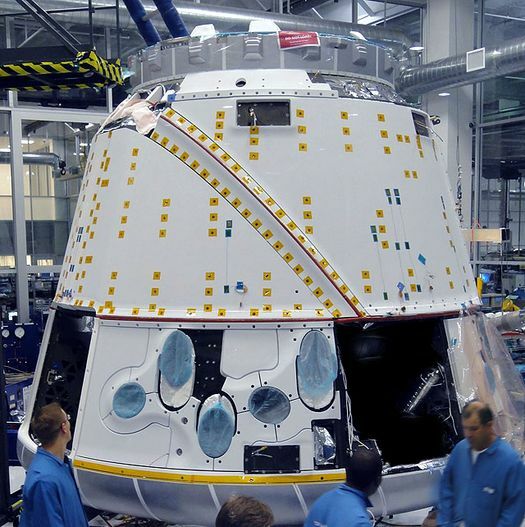 Also in Hawthorne, we have conducted separation tests of the Dragon trunk from the Falcon 9 second stage (shown above). Release mechanisms hold the trunk (top), with solar panel covers on left and right sides) to the stage (bottom). When activated, springs on the Falcon 9 push against the Dragon trunk. 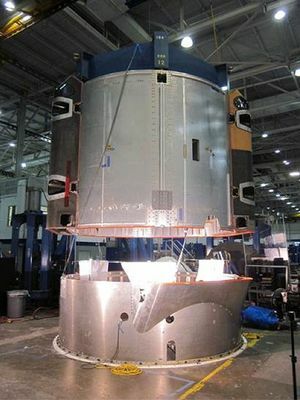 The trunk separates and the test fixture’s counterbalance system raises the spacecraft up and away. In the Hawthorne factory high bay, we tested the Dragon solar array rotary actuator by hanging the full array from the ceiling. The actuator (top center) turns the entire array. 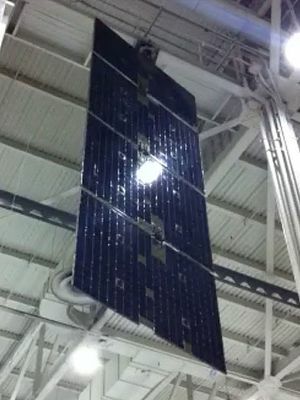 In flight, the solar panels will track the sun for maximum energy capture. We are well into production with all parts (shown above) for the following launch, Falcon 9 Flight 4 and its Dragon CRS-1 spacecraft, which should be the first commercial cargo resupply mission under NASA Commercial Resupply Services (CRS) program. 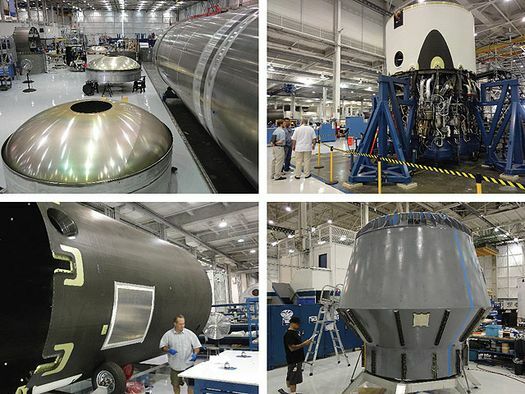 Significant additional tooling and automation with be added to the factory, as we build towards the capability of producing a Falcon 9 first stage or Falcon Heavy side booster every week and an upper stage every two weeks. Depending on demand, Dragon production is planned for a rate of one every six to eight weeks. It looks like Orbital Sciences will be behind the time line again. Why they purchased 40 plus year old Soviet rocket engines is still a mystery if they wanted to remain on schedule. I expect the only reason was money. Future contracts should require that all engines should be made in the USA. Not a half century ago in Russia. Of course then OSC and ULA would both be in trouble. I expect Musk will be first and perhaps best. The NK-33s have been refurbished by Aerojet and renamed the AJ-26. 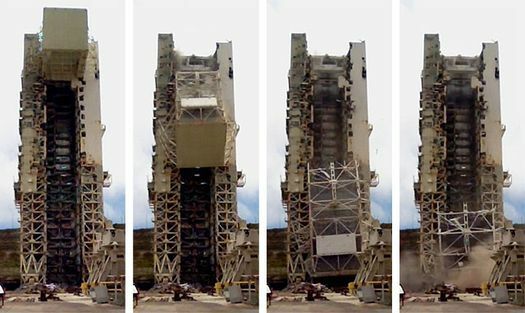 But even with the overhaul, there are still issues with age (corrosion) that destroyed one of the engines on the test stand. They will need to watch that carefully. But, it’s also why they do tests. There has been discussion about restarting the assembly line for these engines in Russia and the United States. I don’t know where those deliberations are at present, but the limited supply problem is solvable. OSC wouldn’t have gone ahead with the project if it wasn’t. Taurus II is designed not just for COTS but as a medium satellite launcher. The Russians are set to debut a new light launcher called Soyuz-1 next year. It’s a downscaled Soyuz-2 with the booster rockets removed and NK-33 engines installed on the first stage. So the Russians seem to have some confidence in the engines.